If you're new to the world of rubber stamping, you may be wondering what types of rubber stamp crafts you can complete with your rapidly growing stamp collection. One of the best things about stamping is that rubber stamps are surprisingly versatile. You can stamp on paper, fabric, clay, or wood and use techniques such as heat embossing or resist stamping to give multiple looks to the same image. This makes rubber stamps a great choice for paper crafts, crafts for the home, and crafts to wear. Card making is a wonderful use for your rubber stamp collection. With rubber stamps, it's easy to create a large number of handmade greeting cards in just a few short hours. For this reason, creating Christmas cards or thank-you notes is one of the most popular rubber stamp crafts. If you're interested in learning how to make handmade greeting cards with your rubber stamps, the Hero Arts website has a number of simple projects for you to try. Rubber stamps also make very versatile scrapbooking embellishments, especially if you're using alphabet stamps or simple geometric designs. However, it's a good idea to avoid stamping directly onto your layout until you've practiced a few times. You don't want to spoil your page with a smudged image! If you never seem to have the right wrapping paper when it's time to wrap a gift, put your rubber stamp collection to work to create special paper that's perfect for the occasion! Buy a large roll of white or light-colored solid wrapping paper, then stamp your designs randomly across the paper. If you wish, you can even add a splash of color with markers or color pencils. Does your home need a makeover? Get some extra mileage out of your rubber stamps by creating fun rubber stamp crafts for the home. For example, rubber stamps can be used to create a lampshade for your bedroom or pretty tile coasters for your dining room table. 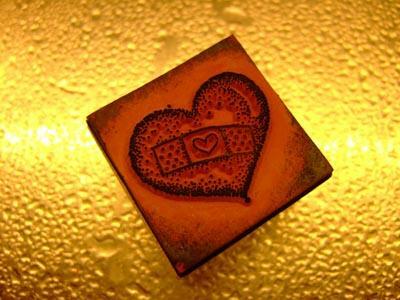 If you have a favorite rubber stamp design, why not use it to create a piece of wearable art? For example, clay stamped jewelry is fun and easy to make. Make a necklace for yourself, then make a matching one for a friend! You can also use your rubber stamps to create fun and whimsical t-shirt designs. This can be a great activity for a child's birthday party or other group outing. Just remember that adult supervision is necessary to prevent any unsightly ink stains!